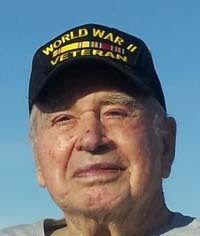 Maurice Chapman Ellsworth, 94, of Carey, Idaho, passed away Oct. 14, 2012, in Scottsdale at the home of his son, Greg Ellsworth. Maurice was born July 16, 1918, in Mesa, the first child of Louis B. Ellsworth and Lillian C. Ellsworth. He grew up in Mesa and as youth enjoyed teasing, running from and riding ostriches raised by his father. He was an excellent student-athlete and was the captain of the Mesa High School track and football teams. He played football at the U of A then transferred to Arizona State Teachers College in Tempe and focused on track, winning the Border Conference in the 220 in 1941. After graduating he joined the Army during World War II. He was assigned to the 467th AAA AW Battalion SP. He was wounded on Omaha Beach on D-Day, June 6, 1941. After several surgeries in England, he returned and became commanding officer of his anti-aircraft battery, receiving battlefield promotions to the rank of captain. He received a Purple Heart, European-African-Middle-Eastern Theater Ribbon with five Bronze Stars and the Bronze Service Arrowhead for his service in the Normandy, Northern France, Ardennes, Rhineland and Central Europe Campaigns. After the war in 1947 he married Norma Owens of Show Low. Maurice was a great father and loved to take his children and grandchildren hunting and fishing. He particularly enjoyed fishing trips in Mexico, and bird and big game hunting throughout Arizona and later in Idaho. In 1962 they moved to Hailey, Idaho, after purchasing several ranches. Maurice enjoyed hunting and fishing on and near his ranches. In the 1970s they bought the Hot Springs Ranch near Carey, and built a home at Carey Lake using the hot spring for heat and culinary water. He liked to walk out his front door to hunt ducks and geese and out his back door to fish for bass. In 1986 Norma, the love of his life, passed away. He was proud of and loved spending time with his children, grandchildren and great-grandchildren. He also began bottling and selling Craters of the Moon Geospring Water. When he could no longer live alone, he moved back to his Arizona roots, living with Patti for a time then with Greg, Tina and their family. As his physical condition deteriorated, Maurice maintained a positive, kind and appreciative attitude. He thanked everyone who helped care for him. He was a great and honorable man, and a true gentleman his entire life. He is survived by his children, Maurice (Julie) of Boise, Idaho; Spence (Laurie) of Carey, Idaho, and Scottsdale, Ariz.; Patti Burke of Show Low, Ariz.; Tim of Boise, Idaho; Pam of Carey, Idaho; and Greg (Tina) of Scottsdale, Ariz., along with 18 grandchildren and 20 great-grandchildren. He was preceded in death by his siblings Louis and Elaine. In lieu of flowers, Maurice’s family suggests contributions to the Romney for President campaign, the Missionary Fund of the LDS Church or the Arizona State Veterans Home. Visitation was Friday, Oct. 19, from 6-8 p.m. at Bunker’s University Chapel, 3529 E. University Dr. in Mesa. Funeral services were Saturday, Oct. 20, at 11 a.m., preceded by a visitation at 10 a.m. at the LDS Mesa South Stake, 2334 E. Pueblo, also in Mesa.